How many motors do you have in your plant, and how old are they? What would it be worth if they all were 5 percent more energy efficient? A 1998 Dept. of Energy report found electric motor-driven systems used in industrial processes consume 63 percent of all electricity used in U.S. industry. 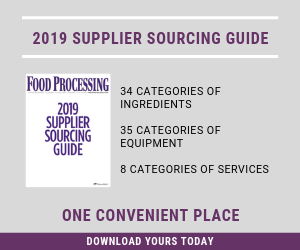 Motor use in the food industry accounts for 60-70 percent of the typical plant’s total energy costs, according to a consensus of industry experts. Yet, the purchase price of a motor accounts for a fraction of its actual cost; at least 97 percent of the costs are incurred by electrical consumption over the motor’s service life, according to estimates from Baldor Electric Co. (www.baldor.com), Fort Smith, Ark. “When you consider a typical 50 hp motor costs more than $25,000 to operate continuously in a year, it’s easy to see how just a few percentage points of higher efficiency can quickly reduce electricity costs and enable the motor to pay for itself,” says John Malinowski, Baldor’s senior product manager for AC motors. 2007 may seem like a long time ago, but the Energy Independence and Security Act (EISA) of that year has a section that is important to all manufacturers but is just going into effect this year, Dec. 19, to be precise. EISA builds upon the previous Energy Policy Act of 1992 (EPAct) mandating even higher energy efficiency standards for general purpose, three-phase AC industrial motors 1-500 hp that are manufactured for sale in the U.S.
All motors built after that date will have to comply with the new rules. Which means soon or later after that date, all smaller motors you buy will be the equivalent of NEMA Premium Efficiency motors, and the larger ones will be more energy efficient, too. General-purpose rating (subtype I) motors 1-200 hp will have to meet a nominal full-load efficiency level based on NEMA Premium efficiency. Subtype II general-purpose motors -- not previously covered by EPAct – up to 500 hp will be required to comply with the energy efficiency standards as defined by NEMA MG 1 (see table). EISA does not affect any inventories of electric motors. The law only applies to new motors manufactured after Dec. 19, 2010. Motors in inventory on that date can be sold or used as before the law. EISA does not contain any requirement to replace electric motors in use. Nor does the law affect the repair of older motors already in service. So the requirements affect only motor manufacturers, not end-users. Malinowksi notes the U.S. leads the rest of the world in use of premium efficient motors. The Europe Union recently announced it would mandate the premium level of motors in 2017. The new energy efficiency rules for manufacturers confirm the No. 1 demand from customers of W.W. Grainger Inc. (www.grainger.com) : driving down operational costs, according to David Strzyzynski, director of segment strategies for manufacturing industries for the Lake Forest, Ill., industrial distributor. Grainger held its annual “Total MRO Solutions” event in January in Orlando, Fla. It’s a conference, trade show and networking opportunity for Grainger, its customers and its manufacturing partners; 4,000 customers were there, including more than 100 in the food & beverage industry. Sustainability is a top concern for Grainger customers, and energy savings is their top method of achieving sustainability. Grainger stocks products that help reduce costs and emissions associated with the burning of fossil fuels. “Through our supplier partnerships and recent acquisition of Alliance Energy Solutions, we are able to offer training, needs assessments and audits in areas such as energy, water, green cleaning and waste reduction,” says a spokesperson for the company. In particular, Grainger last November bought Alliance Energy Solutions, Oxford, Conn., a multi-region energy services company that manages energy-efficient retrofits for facilities. AES solutions involve lighting, HVAC systems, direct digital controls, compressor upgrades and industrial process improvements, and the unit has expertise in securing government incentives, rebates and tax benefits. Other key issues brought up at the meeting, according to Strzyzynski, are managing (usually meaning minimizing) inventory, both motors and repair parts, gaining or maintaining facility food safety certifications and employee safety.